Centennial and Research in Motion recently announced the availability of the BlackBerry 8703e and the BlackBerry 8830 to Centennial customers in Puerto Rico. Cbeyond and Research In Motion yesterday announced the availability of the BlackBerry 8703e on the Cbeyond BeyondMobileTM service, a mobile voice and data service designed specifically for small businesses. The BlackBerry 8703e is designed to keep users connected to important information and communications from a sleek and stylish device with a full QWERTY keyboard, which enables quick and accurate message typing and information entry. Research in Motion and TELUS today introduced the BlackBerry 8703e running on TELUS’ EVDO high speed network. TELUS is proud to offer innovative products like the BlackBerry 8703e, which help our clients stay connected with voice and data services using high-speed mobile communications for both their professional and personal needs, said Robert Blumenthal, TELUS senior vice-president, Products and Services. Operating on TELUS Wireless High Speed service, the BlackBerry 8703e is an ideal device for clients who need fast access to data networks and the powerful e-mail and productivity applications available with BlackBerry. Since When Did the BlackBerry 8703e Get an Antenna? 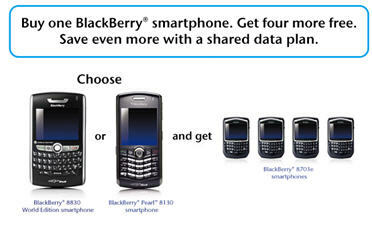 [Read more…] about Since When Did the BlackBerry 8703e Get an Antenna? One of the readers over at BlackBerry Cool while looking through the software downloads on the BlackBerry website discovered an option to download software for the BlackBerry 8703e under the Software Download for Telus Mobility section of the site. Even though there has been no official announcement this can only mean that Telus will carry the BlackBerry 8703e eventually. The only question is when? The BlackBerry 7130e from Sprint is now available on their site. The Sprint BlackBerry 8703e is pretty much the same as the Verizion version although this one includes GPS and Verizon doesn’t. It will also set you back a hunderd bucks more than the Verizon model as it costs $349.99 after a $150 instant rebate. After the release of the BlackBerry 8703e on Verizon this passed Sunday we knew that the first CDMA BlackBerry 8700 series device on Sprint would be soon to follow. Well, it looks like it followed a little closer than we might have imagined. The Sprint BlackBerry 8703e will be released on October 1st. One of the things that I like about the Sprint BlackBerry 8703e is that it includes integrated GPS on Sprints PCS Network. You can also use the 8703e as a high-speed broadband modem for you laptop with average download rates of 400-700kpbs and up to 2Mbps peak speeds. This is more than fast enough to play a game of World of WarCraft while your flight is delayed at the airport. Just how much does the BlackBerry 8703e cost? The BlackBerry 8703e from Verizon is available for sale today, however, we aren’t quite sure how much the device actually costs. According to the screen shot, the 8703e cost $349 with a $100 online rebate with a two year plan, however, costs $399 with a one year plan. If you read the previous post, you are probably asking yourself, “Didn’t he just say that?”, and you would be correct. I am just saying it again because Verizon will eventually correct their website so the screen shot on this post will help explain it a bit better. After a couple of missed rumored release dates, the BlackBerry 8703e from Verizon is officially for sale. You may want to call if you want to get the pricing because it appears that they have mistake in the pricing on the web. According to the site, the BlackBerry 8703e costs $349 and comes with a $100 online rebate if you get a two year service plan for a total of $249. If you only get a one year plan, however, the cost is $399. Either the base price is wrong or the online rebate amount is wrong. Whatever the case, Verizon subscribers have been waiting almost a year since the release of the 8700c and the 8703e is now available for them.